In July 2003 INA was invited to consider the complete excavation of the shipwreck at Playa Damas, located near Nombre de Dios, on the Atlantic coast of Panama. 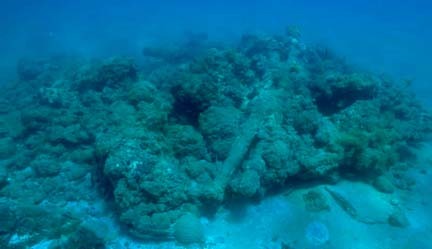 Found in the 1990s, this shipwreck was thought to be Columbus' Vizcaína, a small 50 ton caravel lost near Nombre de Dios during his fourth voyage in 1503. Although we cannot dismiss completely this possibility until we excavate this shipwreck, its size seems to indicate a larger vessel. Fig. 1 - Location of the Playa Damas Shipwreck. The Spiegel group made an agreement with INA and will try to raise money to fund the excavation and conservation of the Playa Damas shipwreck. The money is to be donated by several European sponsors who asked for nothing in return. In July 2003, representing the Institute of Nautical Archaeology (INA), I went to Hamburg, Germany, to meet with the Spiegel team. 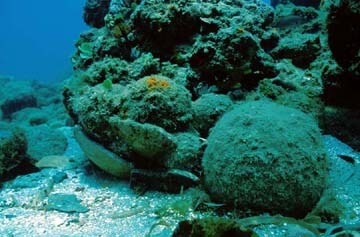 The Spiegel-TV team had already done some tests on materials from the shipwreck, and found it to be incredibly old. A sample of the hull's timber - from an oak hull plank - was dated to the late 15th century. Panama had just changed its law concerning the protection of its underwater cultural heritage, and had transposed the UNESCO Convention on the Protection of the Underwater Cultural Heritage to its national juridical order. This makes it a perfect opportunity to show the world that developing countries can be on the front line in fields like nautical archaeology. The Spiegel group agreed to raise funds to help pay the excavation, conservation, publication, and possibly exhibition of the artifacts of this shipwreck in Panama. The details of the exhibition of the artifacts will be planned at a later date, depending upon the amount of money raised by the Spiegel group, INA and Texas A&M University. In the mean time, the Dirección Nacional del Patrimonio Histórico received the cooperation of the German government through the German Archaeological Insitute to run tests on organic and inorganic samples from the site in order to determine its relative antiquity. All of it was done with the support of the Spiegel group. Fig. 2 - Playa Damas Shipwreck (photo: Karl Vandenhole). Although at this stage this project is only a survey and preliminary study of the Playa Damas shipwreck site, it would not be possible without the support of a wide group of people. I wish to thank the Instituto Nacional de Cultura and especially Dr. Carlos Fitzgerald for his patience and cooperation. Also the team from Der Spiegel, for the articles and the book: Die letzte Reise, Der Fall Christoph Columbus, by Klaus Brinkbaeumer and Clemen Hoeges. They are the best journalists I have ever worked with and are to be commended for their professionalism and scholarly approach. It will be impossible to name here all those who helped me save this shipwreck for scientific excavation, but I must thank everyone who supported me by writting letters to the governor of the province of Colon and the treasure hunting company who wants to salvage this ship. These include: Dolores Elkin and Diana Rolandi from Argentina, Art Cohn, James Hunter, Robert Neyland, Donald Keith, Toni Carrell, Cheryl Ward, Amanda Evans, Roger Smith, and many others from the USA; as well as Jorge Herrera from Mexico, Tatiana Villegas and Catalina Garcia from Colombia; Gilson Rambelli, Flavio Calippo and Paulo Camargo from Brazil. I was also supported by Gabriel Carranza and the Office of Latin American Programs at Texas A&M University. Finally I must thank Dr. Peter Amaral for his generous contribution to the Institute of Nautical Archaeology. It made our second trip to Panamá possible and may have determined the ultimate success of this project. Klaus Brinkbaumer and Clemens Hoeges, "Die letze Reise des Columbus (I)", in Der Spiegel, No. 25, 14.Jun.2004. Klaus Brinkbaumer and Clemens Hoeges, "Die letze Reise des Columbus (II)", in Der Spiegel, No. 26, 21.Jun.2004. Klaus Brinkbaumer and Clemens Hoeges, Die letzte Reise, Der Fall Christoph Columbus, München: Deutsche Verlags-Anstalt, 2004. Castro, Filipe, Playa Damas Project - Preliminary Report submitted to the Institute of Nautical Archaeology Archaeological Committee, 2004. Castro, Filipe, Playa Damas Project - Artifact Inventory - ShipLab Report 9. On file in in Nautical Archaeological Program Library, Texas A&M University, 2005. Nautical Archaeology Program, Texas A&M University.